HOW TO CHOOSE THE “RIGHT” WATERMELON (AND WHY TAPPING DOESN’T WORK) - What About Watermelon? Since you can’t stealthily peel back the wrapping of a watermelon in the grocery store to sneak a peek at what’s inside, you’ll have to employ some different techniques to determine its “ripeness.” Personally, I use the following three-step process to find the right watermelon and I have to admit, it hasn’t failed me yet! 1. LOOK – Your watermelon should be firm, symmetrical and free of major bruises or scars. Some minor scratches are okay, however. After all, the purpose of that thick rind is to protect the delicious contents inside. Ripe watermelons should also be dark green in color. 2. LIFT – The ripest watermelons have the most water. And since watermelons are 92 percent water, your watermelon should be relatively heavy for its size. 3. TURN – Turn your watermelon over and check out its bottom, which should have a creamy yellow spot (also called “the ground spot”). This is where the watermelon sat on the ground while it soaked up the sun at the farm. If this spot is white or greenish, your watermelon may have been picked too soon and might not be as ripe as it should be. Here’s my stance on using your watermelon as a bongo drum in the produce aisle: While it’s true that the “sound test” can give you some insight on a watermelon’s ripeness, I don’t endorse or use the test because it’s too subjective and there’s no definitive agreement on which result the test is supposed to yield. In other words, you can tap-tap-tap all you want, but if you perform the three-part test we talked about earlier, you should have no problem finding a great watermelon. As always, if anyone has any other tips or can clarify the sound test (please! ), feel free to leave a comment! the firm, dark green, heavy ones never any good for me. never ripe, but i will look for the yellow spot next time. just threw one away today. Is the size of the melon important for sweetness? My wife just bought an oblong-shaped smaller organically grown melon since we have limited refrigerator space. It looked good and sounded good as far as the thump test, but we were unhappy. It was very juicy but bland and not sweet at all. I had one just recently also that was very, very juicy but not sweet at all. i am a diabetic and really love chilled watermelon 24 x 7! I sometimes find a white vein in the middle and it seems dry and unpleasant. now, I will look for a yellow bottom, bee spots and a thumping sound with a vibration (really, b flat?). some are just great and I can eat 1/2 at one sitting, and when at night it makes me hit the bathroom but back to the frige for some more watermelon. so, I will look for the yellow bottom, dark green body and maybe a thumping test. why can’t you just get an xray of the inners and let that tell you the best? maybe I will invent something! What does being diabetic have to do with liking watermelon? 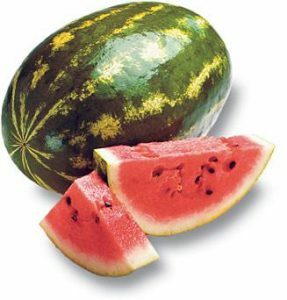 Honestly, watermelon (and most fruit) is not good for people with diabetes; it has a very high sugar content. The sugar in fruit is not very different from cane sugar. Diabetics are often given terrible dietary advice and only told that they should avoid cane sugar, when all carbs (including many grains, fruits, and vegetables that are generally considered “healthy”) raise blood sugar and increase need for insulin. If a doctor or dietitian told you that you could eat unlimited amounts of fruit, please try to get some updated information. I recommend Dr Richard K Bernstein’s books, especially if you have Type 1. (I have Type 2.) Take care! I was also taught that fruits are very high in sugars and to be very careful how much you eat with diabetes. Iam not diabetic and have recently cut out sugar from mine & my husband diet. Our sugar intake is now from Watermelon, and all other fruits. The hollow sounding watermelon has never let me down. A dull sound will mean an inferior tasting melon. In the past, I’d settle for a melon without the hollow sound and regretted it. I will now also look for the yellow spot. Thanks for the info! After looking for the yellow ground spot check the stem. It should be dark. A light color stem means it was picked green and probably still it green. Watermelons will not continue to ripen off the vine. Pretty good advice, however, the thump test will give an indication if the watermelon is starting to separate in the middle. also press on the opposite end from the stem if it yields easily your melon is a gonner. Suzy A watermelon will continue to ripen after harvest if it was not picked too green. the stem must start to die from the vine befor it is picked. If you see a thick sturdy green stem but your melon meets all other guidlines the rind may be very thick. Mike’s Produce Guntersville AL HY 431. What has always worked for me is that watermelon should have a small very string yellow circle (not creamy or light yellow) on one end and opposite side of that circle should be drak green in contrast. tapping will give you firmness of the melon. I have always found yummy melon.Besides what you have said i always look for brown scars,(i have read they are formed because the thing is growing to fast and it is kind of a tare,and i have heard it is where insects (bees) have went after it for its sweetness).And Yes you dont want a mushy feel to any part of it.And if you know how to become one with the melon (be the melon) that will certainly help. A man selling watermelons from a truck from Hermiston Oregon (home of the best watermelon in the nation, they are famous for their melons) said to look for tiny holes in a concentrated spot in the watermelon,,,that is where the bees have tried to get into the melons due to their sweetness (aka ripeness)…it has worked every time for me… and indicates not being picked too early and stored somewhere…. Good advice, but one correction. I live in Colorado, but the sweetest watermelons I’ve ever had come from a place called Hempstead, TX. It’s about 1 hour northwest of Houston. True!! actually tapping .. I flick end of my finger .. works with checking ripeness on full range of veges and fruits. A high pitched sound means it is tight, not soft and ripe. Try it on anything .. bananas, squash, as you like. The dull, thump thump sound means it is soft, more full of water .. and more ripe. All the words people use to define the sound are confusing. “High pitched”, and dull “dud dud” are easy to understand, and easy to determine in market place or garden. Snap some green and then overripe bananas and you will learn the difference quickly. I am a fruitarian, mostly, and have been doing this for years. We always go with the method of just picking the largest that doesn’t look horrible. That is almost always better than using the sound, which we’ve found (like the author) to be not a good signal. Well, i never pick a good watermelon, so this summer i’ll try the three step program! in fact i’m going to copy the three steps & put it in my purse right now, that way i won’t miss any of the steps! I’ll let you know if it works. Thank you for the information. I spent many summers in Bakersfield, CA. My Pampa(grandfather) would say to look for that large white/pale yellow spot. The larger the spot, the longer it sat in once place while on the vine. I have always used that technic and it’s only been wrong once(my fault for caving to a craving in winter, in the off season). But in my childhood, the watermelons were huge & oblong, with seeds. Some skins were dark green, some with stripes. Now they all look the same and are all about the size of an oval basketball. But my Pampa’s system seems to still holds true! I bought a watermelon 2 days ago using the three steps above, plus checking out the stem. It was beautiful, juicy, sweet and was plain old PERFECTION !!! It was a round melon, not an oblong one, so the spot on the “bottom ” was small but I had written the tips on my list to help. I will use this method going forward. Thanks so much! This is the best watermelon picking advice ever. I have only been wrong two or 3 times since I started doing this and those times I was wrong I just really wanted a watermelon. I have to give credit where credit is due. This is by far the best way to come home with the sweetest watermelon. When I follow those 3 rules I always get a great result!!! Always! I can’t thank you enough for this site! I grew watermelons last year, Cool Guy, and I was tempted to cut a hole in them, too. Unfortunately, you can’t do that without ruining the watermelon. With this knife you can easily cut a plug into a melon. Stick it in, twist, turn then take out. The bottom of it should be an inny like a belly button. Worked 99% of the time. It appears that the watermelon variety that I grew this summer (Orange Tendersweet) does not develop those light spots on the part where it was sitting. My two watermelons were green all over, and never changed color. No scent, either. I couldn’t tell if they were heavy for their size or not, as there was nothing to compare them to. I just had to guess based on when the seeds had been sown (June 21st). Our summers are long and warm well into the end of October, and I finally harvested the second one today, from a vine that was still green and healthy. Sometimes none of the tests work. One of the comments was made by a diabetic who ate watermelon 24/7. Watermelon has a lot of sugar in it, therefore should be avoided, not consumed in large quantities continuously. Recent research has repeatedly shown that a high-fat very low carbohydrate diet can reverse diabetes. That include avoiding sugars from fruit. oo juicy. I love me some watermelown. …as for tapping, it fails sometimes, indeed it does. BUT I tap and listen for a sound as if a stress is on the peel anf just the right “hit” will cause it to burst from its own pressure! BOONG BOONG!! like a taut drum, ready to pop! BUT they are not always sweet when they “sing” so, and sometimes REGRETTABLY only pink.